As you probably do not know, I'm currently trying to build a semi-digital radio interferometer at 408MHz, for astronomy. I played around a bit with patch antennas, and did some very basic "interferometry" tests with them. Some extremely bad tinfoil patch antennas being used for "interferometry"
There's an arbitrary number of antennas (the more the better) which receive radiation from every direction equally. Those antennas are distributed across... uhm... my garden with some yet-to-determine fancy arrangement. Coaxial waveguides of some arbitrary, but known length go from each antenna to a central point. At this central point there's a computer-controllable input multiplexer which selects two of the antennas. The signal of one of the antennas is delayed by a delay line (some more coaxial cable) to make signal travel time from the observed source (e. g. the sun) to the central point roughly equal. This is done repeatedly for all pairs of antennas. I imagine switching to happen several thousand times a second. This should not be a problem since all the used circuitry supports this (e. g. the switches need ~40ns to operate, the ADC should be sufficiently fast, ...). The delay line is done, it seems to work okay. It currently allows up to 150ns delay in 10ns steps, and it could be extended by one or two more powers of two by just adding cable. It might be necessary to redesign the PCB to maintain the signal integrity better, it's sort of lossy currently, but basically this problem can be considered as solved (I know what changes to the PCB would be required but I'm too lazy to do them until it proves to be not good enough). There's a prototype for the preamplifier based on this, but it needs to be adjusted to have lowest noise-figure at 408MHz. There's a prototype for the antennas. More about that below. There's a very rough prototype for software which reconstructs the sky brightness distribution which works on simulated data. There's no plans for the input multiplexer but I expect this to be sort of trivial (just a cascade of switches should be enough, or maybe I can even find a dedicated RF multiplexer chip). But now, something about patch antennas! I think this kind of antenna is sort of suitable for my purpose as it is easy to build and design, nicely storable and transportable, and especially because it has a very uniform radiation pattern in all directions (which i want) except downwards -- when using a ground plane (which I want too). So I built some really really bad prototypes from tinfoil, tape and cardboard, and with almost-as-bad measurement techniques, I determined that they have roughly the expected properties. 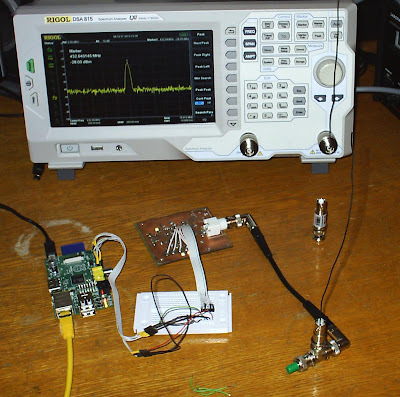 Frequency synthesizer with "antenna" emitting a (very weak) signal for testing purposes (front) and spectrum analyzer checking that it works by using an identical piece of wire as a receiving antenna (back). It also involves the Raspberry Pi, yay! And breaboards and wires, of course. 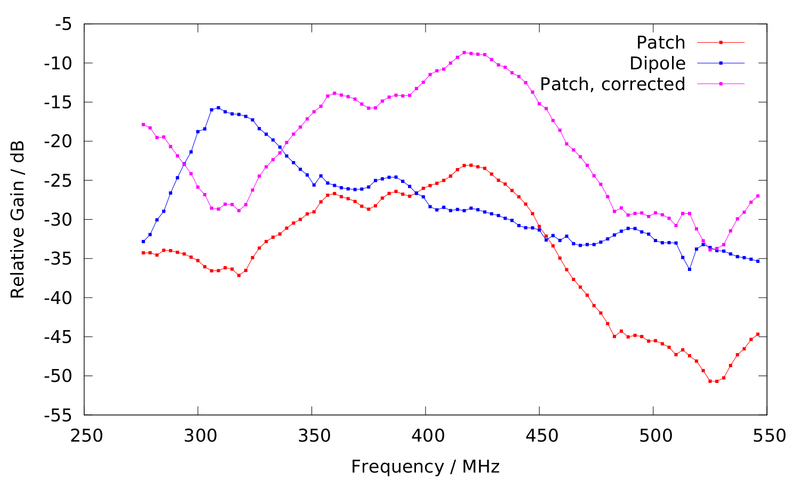 Patch antenna frequency response. Notice that this is created based on a ridiculously bad measurement method and does not have any scientific value. It's just for illustration and checking that things work roughly as they're supposed to. 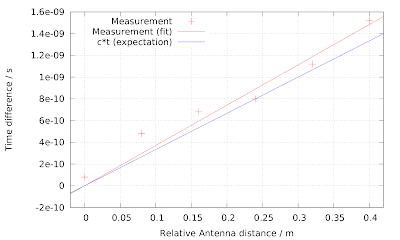 Doing some correction because the dipole also has a non-flat frequency response gives the pink curve, which shows that the design goal of having an antenna which is good at 408MHz was roughly achieved... probably. Signals from two patch antennas when the distance from the transmitter is equal for both. 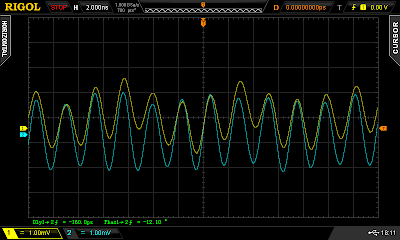 The modulation of the 432MHz signal with other frequencies (the "wobbling") shows the necessarity of a suitable filter for real-world application. 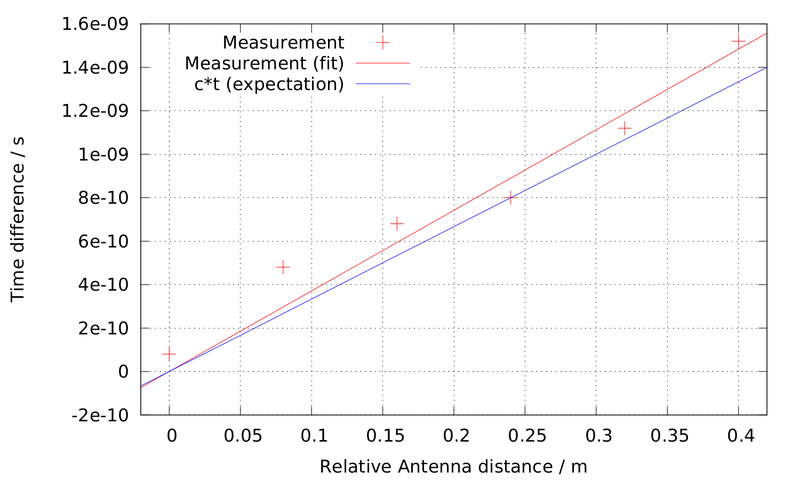 Antenna distance versus measured time difference. Red is the measurement with fit, blue is what you'd expect from the speed of light. This diagram, again, is not supposed to be science, it's just checking that things at least look like they'd work as expected. 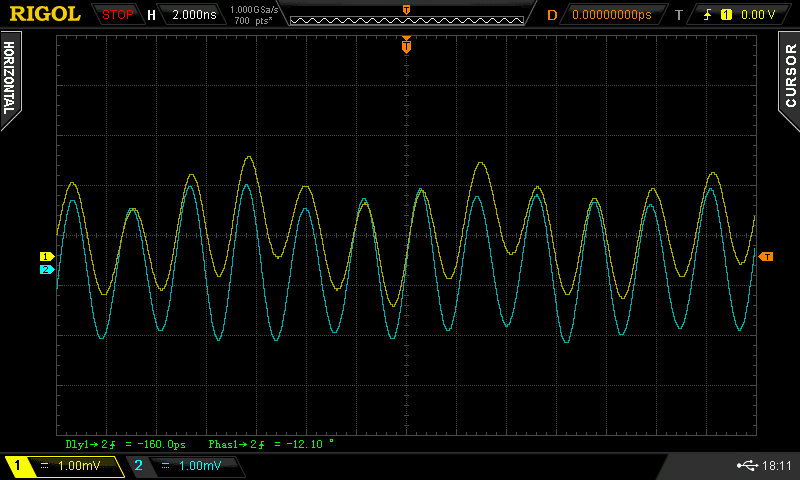 Given that the scope's sample rate is barely enough to measure the signal's phase at all, the result seems acceptable. The scope will be replaced by an AD8302 in the final setup. Unsurprisingly, the "a signal arrives later if the antenna is farther away" stuff works (you still need to check, right?). 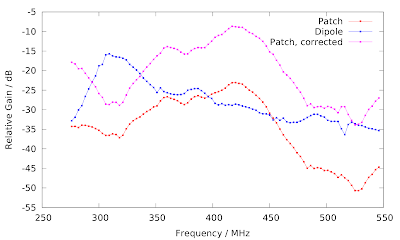 Altough the patch antenna's frequency response is narrow, a filter is very much needed. You can't solder tinfoil. Don't even try it. The next thing I'll work on is the filter design. Maybe I'll build some microstrip filters, just to see how well they work. I'll write another post if I find something new about that. When the filter design is done, then it's basically just about putting all the pieces together; most major problems I can imagine are solved then. I'm really excited whether this is going to work at all!